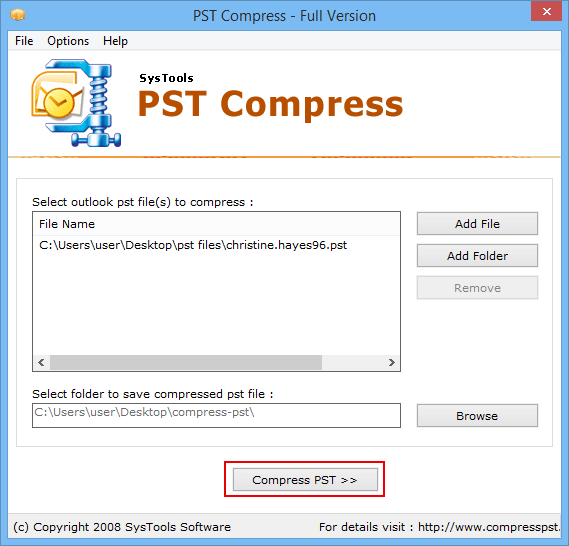 The Compression of PST Outlook files using this tool is highly efficient. Even for ANSI files which become a matter of concern if they reach 2GB limit, this tool reduces PST size to kill the corruption. This PST Compact Utility reduces file size to make it more manageable and free from corruption issues. 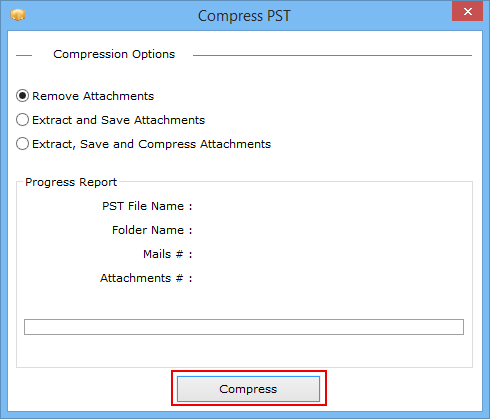 PST Compress Software has the tendency to compact the size of Outlook files and then zip the entire attachments present within a PST file. This tool will fetch or extract all the attachments of PST files and then save them all in a different folder. 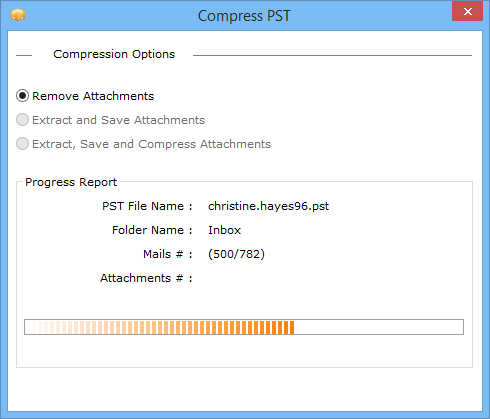 PST Compress has a very smooth processing. 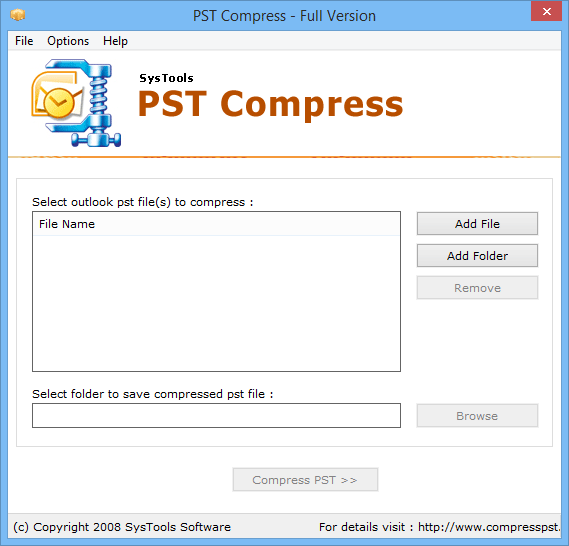 In case, the user has a serious urge to reduce the size of the Outlook PST files then, this PST Compact software will remove all the attachments included in the PST files. If the option is selected, accordingly the tool will delete all the attachments permanently from files and from machine also. While reducing size of PST the tool will show a live status report of export and progress report as well, which will include all the details including PST file name, PST folders, number of emails found within the PST, number of attachments in Outlook PST file/folders and much more. 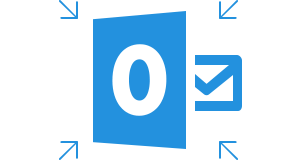 The software for shrinking PST files size is highly compatible with all versions of Windows i.e, all 8.1 and below versions. Moreover, this utility does not hamper the original data and maintains the integrity of the PST files. This tool has an excellent compressing files mechanism. Will my data be safe if I undergo the process of compressing PST files using this tool? 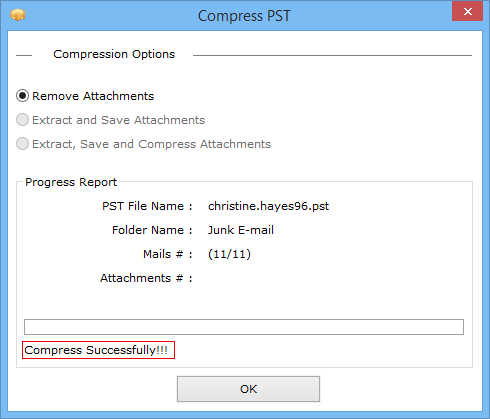 Yes, while shrinking size of Outlook .pst files using PST Compressor Tool, no harm to original data will occur. Your data is always safe in our tool’s hands. Can I compact PST files in a bulk mode because I have a large number of files? Yes, user can reduce the file size of PST files in a batch process by this tool. Is there a limitation on the size of PST files that are processed to reduce by the tool? No, there is no restriction on the file size of PST files that are to be put under compression process. 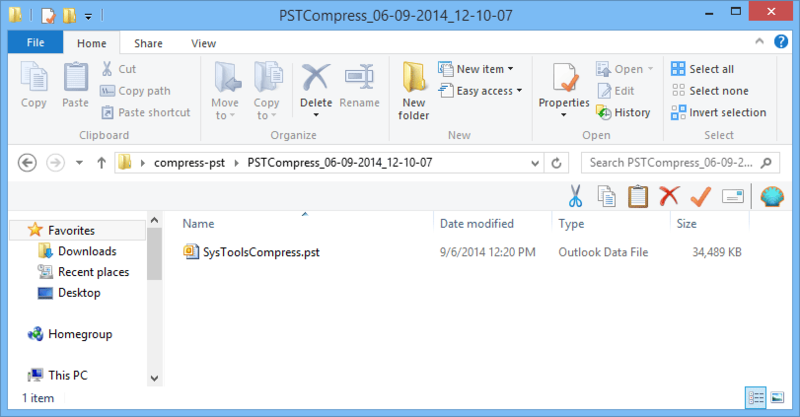 Will the PST Compacting Software work if there is no Outlook on my system? No, it is mandatory to have MS Outlook installed on your system if you wish to carry out the PST file size reduction process. 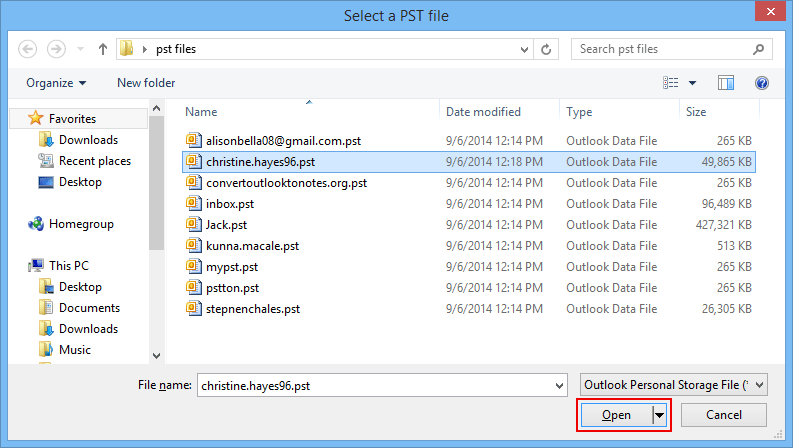 Is there an option in the tool to delete the unwanted attachments from PST files while compressing Outlook folders? Yes, there is a special Remove button in the software execution process to remove undesired files while shrinking PST file size. "Using this Compact PST Software has helped me immensely whenever I have an urge to communicate and share files with my team. This tool is really reliable to use and I easily compacted Outlook PST files with this. Thanks a lot for this helpful innovation!" "We are highly impressed and happy with the exactness of this PST Compressor Software. It has helped us in shrinking size of numerous Outlook PST files all at once. Working with this tool, I must say that it is time saving and proficient tool. Totally swear by this product of yours. Thanks a bunch!"